Each unit of the navigation system connected to the AVC-LAN (communication bus) transmits switch signals via AVC-LAN communication. 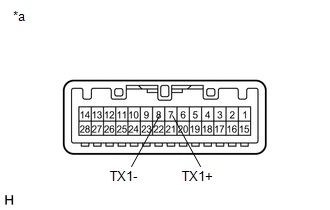 If a short to +B or short to ground occurs in the AVC-LAN, the navigation system will not function normally because communication is not possible. (a) Remove the navigation receiver assembly (See page ). (a) Disconnect and reconnect each slave unit one by one until the master unit returns to normal. If disconnecting a slave unit causes the master unit to return to normal, the slave unit is defective and should be replaced. Master unit returns to normal.